Those words come from a famous Danish scientist. And they are true. Research has shown that people with strong social relationships have lower morbidity and mortality and have a better possibility of recovery or survival after illness. 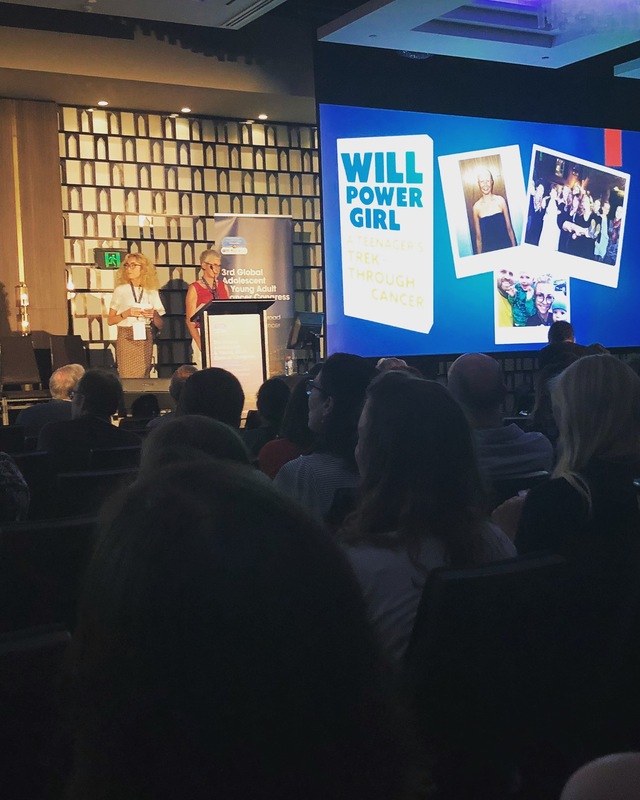 This was exactly the topic of my speak at the 3rd Global AYA Cancer Congress in December 2018. I had the honor of being one of the opening speakers together with Clinical Nurse Specialist, Pia Riis Olsen. (She has actually done a Phd in ‘Networked based nursing’. She is also the co-editor of the book “Nursing Adolescents and Young Adults With Cancer – Developing Knowledge, Competence and Best Practice”. And on top of everything she is one of the founders of the AYA unit where I was hospitalized). “I was diagnosed with Ewing’s Sarcoma when I was 16. (That’s me up there on the picture, being 16 and sick). Today, I have a good life, as you can see on the picture in the bottom where I’m with my husband and our two sons: Erik is now 3 years old. Harald is 8 months. The third picture shows me with my friends. It’s from the release party of my book “Willpower Girl – A Teenager’s Trek Through Cancer”.The book shows my life during and after cancer. I am here today to share with you the difference friends like these can make if you are as sick as the girl up there. And I did do a lot of sports back then, so the doctors words made sense. But when I found out that the name of the pain was ‘cancer’, nothing made sense anymore. And that was the worst part of it all: Not understanding what was going on inside of my own body. The feeling of suddenly being different, being a stranger to myself. I feared being abnormal. I longed for a normal teenage life with boys and parties and school and gossip and arguing with parents. When I stood in front of the mirror it became clear to me how sick I was. But I was afraid that if people saw me without the wig, they would see a sick person whom they would feel sorry for. In fact, my big brother, Peter, was the only one I was comfortable being around without the wig. He would tease me the same, despite cancer. And in his own lovingly way he told me I looked like a mix between a fish and Gollum from Lord of The Rings. Cancer Mette: She needed visits at the hospital and a hand to hold. Normal teenage Mette: She needed her friends, her school and the life that was taken away from her. We were only 16 years old, but thanks to the network meeting which Pia will tell you more about, my friends understood that both of these versions of me needed to cry AND to laugh. I wake up confused and blink. Everything is foggy. Everything is foggy. The nausea sits in the back of my throat along with the disgusting aftertaste of vomit and chemo. I just want to sleep. I am stretched out on a low-lying gurney in a hospital room that is not mine. Where am I? I hear voices, ones I can recognize. I squint and look up. My parents, their friends, my brother, Peter, three of my friends, and their parents are standing like dutiful students surrounding a teacher’s desk. Nurse Natalie, Dr. O, who is the head of the oncology department, and a surgeon sit on the other side. They are the expert panel, though Dr. K, who did the biopsy, is notably missing. The three of them take turns speaking, while everyone else remains obediently quiet. I realize what is happening. It’s the extended network meeting Natalie described. It’s an opportunity for the immediate family members to gather friends and relatives so the doctors can brief everyone about the situation all at once. Dr. O tells about the disease and the chemo. About the bone cancer, the risk of metastasis and about my initial six-month course of chemo, which is to be followed by surgery and then yet another chemo go-round of six months. The surgeon speaks next. He explains what the operation will entail and shows the metal prosthesis that will be surgically placed inside my right leg. As he speaks, he vigorously waves the large and intricate metal device in the air as if it were a sword. It’s my future leg. I close my eyes again. This just can’t be real. There is no way any of it can be true. I struggle to stay awake using every drop of energy I have because I really want to hear everything that is being said, especially by Natalie. I have no idea what it means to be as young and as sick as Dr. O just told the assembly that I am. Because of that meeting my parent’s friends drove my friends 2,5 hours each way to the hospital and back again on school nights so they could give me a hug. Because of that meeting everyone around me knew how and when to help. They became my road crew. And like in Tour de France no one climbs their cancer mountain alone. My crew knew exactly when to give me a hug or a high five. Because of that meeting I felt included. My friends began to plan their birthday parties according to my chemo calendar. The party planning committee at the high school began to plan Friday Lounges according to my chemo calendar. And then I began to live in three weeks periods. Week 1: I was hospitalized with chemo. My friends came to visit. Week 2: I was sick from side effects. I was at home or at the hospital. My friends came to visit. Week 3: I felt like me again. I could attend school. I could eat. And my friends took me out. Week 3 was my gasoline for another round of chemo. The more ‘Normal Teenage Mette’ experienced in week number 3, the less side effects were there to get through for ‘Cancer Mette’ in week 1. It was like having an inner bank accountof energy that needed to be in balance. And my friends made a big difference keeping that balance. My friends didn’t cure me! The doctors cured me. Chemo cured me. But my friends helped me through the tough chemo days. And I hope that my story can help you help others do the same for their friendwho might be out there right now feeling lonely with his or her cancer.